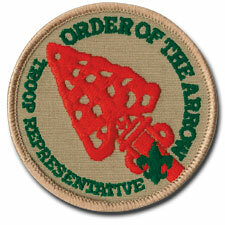 The Order of the Arrow is Scouting’s national honor society. OA members are dedicated to the ideal of “cheerful service”. They also encourage other Scouts to participate in camping events. The Northwest Order of the Arrow Chapter meetings are held at 7:30 pm on the second Thursday of every month (as a breakout session of the Northwest District Roundtable) and are located at Centennial Methodist Church in Roseville. We encourage every Troop to have an OA Troop Representative attend the Northwest OA Chapter monthly meetings. The Order of the Arrow Troop Representative is a youth liaison between the local OA lodge or chapter and his troop. In his troop, he serves the Arrowman as well as adult leaders and Scouts who are not OA members. He encourages Arrowmen to participate in lodge and chapter events. He also works to strengthen the troop’s camping program. Encourages participation in monthly camping outings. Encourages participation in summer camp. Wear the field uniform (class A) correctly to all regular troop meetings and religious services. Wear the activity uniform (class B t-shirt) to all outings and other troop activities. Lives by the Scout Oath, Scout Law and OA Obligation .